What is in-vehicle monitoring technology? How common is in-vehicle monitoring technology? Does in-vehicle technology reduce the risky driving behaviour of young drivers? Is in-vehicle monitoring technology otherwise beneficial for young drivers? What do parents think about in-vehicle monitoring technology? What do teens think about in-vehicle monitoring technology? How would in-vehicle technology affect Graduated Driver Licencing (GDL) programs? What else can parents do help reduce crash risk of young drivers? What initiatives are available that support or administer in-vehicle technology? Forcing. This system teaches the driver safe behaviour through habit and blocking unsafe bevahiour. E.g., the driver cannot turn on the vehicle until their seatbelt is fastened. Feedback. This system provides a cue if a driver is driving in a hazardous manner. E.g., if the vehicle is travelling faster than the posted speed limit, a sensor will alert the driver with either a flashing light or a noise. In-vehicle monitoring technologies installed in the vehicles of young drivers are designed to prevent risky behaviours, either by restricting speeds, locking out certain functions (such as the radio) or deterring risky behaviour by triggering a report to be sent to parents if a driving violation is committed.3 These technologies can help protect young drivers who have the highest crash risk of all driver age groups. To illustrate, when sober, 16-19 year olds have a fatal crash rate more than four times as high as that of drivers aged 25-34, and nine times as high as drivers aged 45-54.4 Only a certain amount of risk can be prevented through driver education and awareness programs for young drivers. 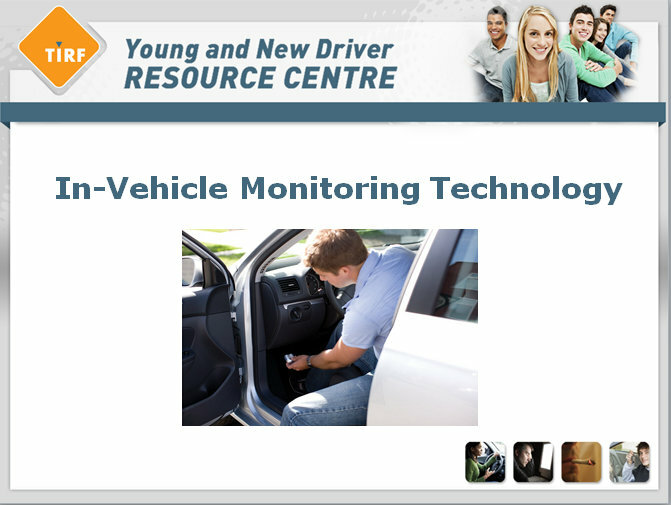 The use of monitoring devices can provide an extra layer of protection for the young driver. Up to this point, in-vehicle monitoring technology has been used primarily by researchers for study purposes, and has yet to become popular in the general population. Not surprisingly, a survey conducted of parents of young new drivers in the United States (U.S.) found that only half of these parents were aware of in-vehicle monitoring technology.5 Currently, parents are using more traditional means to manage their teens such as imposing rules, setting curfews, and restricting vehicle access. At this time, in-vehicle monitoring technology is costly and requires technical knowledge to install and use. Until these barriers have been overcome, parents will likely continue to rely upon known methods of parental authority in order to set driving boundaries for their young drivers. Once the benefits of the technology become well known, it may become a popular driver education tool. In-vehicle monitoring technology could complement GDL programs already in place. During a driver’s primary unsupervised period, a video recording device could act as a form of supervision. If teens are aware that parents have access to the feedback provided by the sensors, they are more likely to drive within safe restrictions. The use of this technology to condition teen driving behaviour can help them create and improve safe driving habits that they will have for life.14 In-vehicle monitoring allows parents to gauge whether their young drivers are abiding by the Graduate Driver Licensing (GDL) program restrictions in their particular stage of the program (e.g., number of passengers, road types restricting speed). A pair of ‘eyes’ in the vehicle to document whether or not drivers comply with the rules of their GDL stage can help programs have farther reaching effects than without the technology. American Family Insurance includes in its Family Auto Policy the Teen Safe Driver Program. Customers with the Family Auto Policy can have an in-vehicle monitoring device installed in a young driver’s vehicle once they have acquired their full licence and no longer have a supervisor accompanying them, free of charge. The device detects any sights and sounds related to erratic movement and if an incident occurs (e.g., extreme braking, cornering or accelerating too quickly, crashes) the camera records the first eight seconds before the incident and the four seconds afterwards. This information is transmitted wirelessly to the Teen Safe Driver Center and it is reviewed and objectively evaluated by a trained driving coach. Each week the parents of teen drivers receive a report card detailing the teen’s performance and they also have access to footage of any incidents. This allows parents to start a conversation with their teen about their driving behaviour and to discuss their strengths and weaknesses on the road and safe driving habits. The camera could prove that teens were not (or were) responsible for a traffic incident. The technology gave teens an ‘out’ for peer pressure. Teen passengers understood that their behaviour was being recorded and thus they needed to abide by the rules of the vehicle (e.g., passenger restrictions, volume of music). Similarly, the Canadian insurance company Industrial Alliance has a car insurance program called “Mobiliz” in which the customer can install a monitoring device into their vehicle and have their driving regularly monitored. The device tracks the driver’s acceleration, number of kilometers driven, nighttime speeding, sharp braking, and speeding over the speed limit. From their driving behaviour record, the customer is ranked as exceptional, safe, normal, unsafe or dangerous, and their premium is based on this ranking. This means that there could be a discount or an increase in their premium each month, depending on their driving behaviour. The program, which was originally developed for teens, is also available to drivers who are 25 and older. Car manufacturers are also beginning to take advantage of in-vehicle monitoring technologies. Vehicle manufacturer Ford has offered the My Key feature in its vehicles since 2010.19 This system allows parents to preset certain controls in their vehicles for teen drivers. For instance, My Key can automatically set limits on speed (to 135 km/hr) and mute the audio system volume until the safety belts are buckled. Additionally, this system gives extra warnings to young drivers who may not be familiar with certain vehicle features yet. One example of this is an extended warning period for low fuel (e.g., 100 km to empty instead of 30 km), allowing more time for young drivers to safely pull over for gas. American Family Insurance. (2012). Teen Safe Driver Program. Retrieved from: http://www .amfam.com/microsites/teen-safe-driver/default.asp. Brovold, S., Ward, N., Donath, M., Simon, S., Shankwitz, C., Creaser, J. (2007). The use of technology to address patterns of risk among teenage drivers. Journal of Safety Research. 38(4), 413-422. Farmer, C.M., Kirley, B.B., McCartt, A.T. (2010). Effects of in-vehicle monitoring on the driving behavior of teenagers. 41, 39-45. Foltz, R. (2011). Parental Monitoring or an Invasion of Privacy. Reclaiming Children and Youth. 20(3), 41-42. Ford Motor Company. (2013). My Key. Retrieved from: http://www.ford.ca/technology/?polaroid=p17&searchid=google|yBKLwjxR. Governors Highway Safety Association (GHSA). (2014). GHSA Directions in Highway Safety. January 2014 Issue. Washington, D.C.
Huang, Y.H., Roetting, M., McDevitt, J.R., Melton, D., Courtney, T.K. (2005). In-Vehicle Safety Feedback. Professional Safety. 50(1), 20-27. Insurance Institute for Highway Safety (IIHS). (2004). Status Report: Many risky beginners aren’t driving the most crashworthy vehicles. 39(8), 1-8. Mayhew, D.R., Simpson, H.M., & Singhal, D. (2005). Best Practices for Graduated Licensing in Canada. Ottawa, Ontario: Traffic Injury Research Foundation. McCartt, A.T., Hellinga, L.A., Haire E.R. (2007). Age of licensure and monitoring teenager’s driving: Survey of parents of novice teenage drivers. Journal of Safety Research. 38(6), 697-706. McGehee, D.V., Raby, M., Carney, C., Lee, J.D., Reyes, M.L. (2007). Extending parental monitoring using an event-triggered video intervention in rural teen drivers. Journal of Safety Research. 38, 215-227. Musicant, O., Lampel, L. (2010). When Technology Tells Novice Drivers How to Drive. Journal of Transportation Research Board. 2182(1), 8-15. Williams, A.F., Leaf, W.A., Simons-Morton, B.G., Hartos, J.L. (2006). Vehicles Driven by Teenagers in Their First Year of Licensure. Traffic Injury Prevention. 7(1), 23-30.